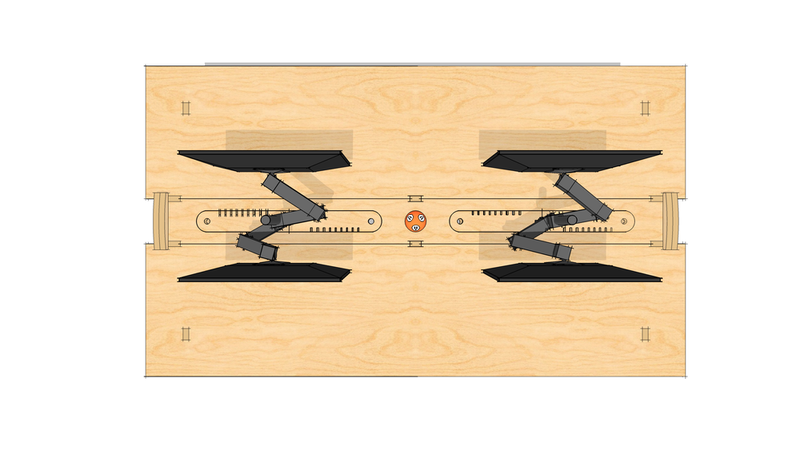 This quad-monitor table is a new design for a client in Nashville, TN. The table is loosely based on the WELD Table, but rather than being designed for a nomadic user, the Quad-Monitor Table is designed primarily for permanent users. And like most Klevr items, the table is a flat-pack design that requires no tools for assembly. 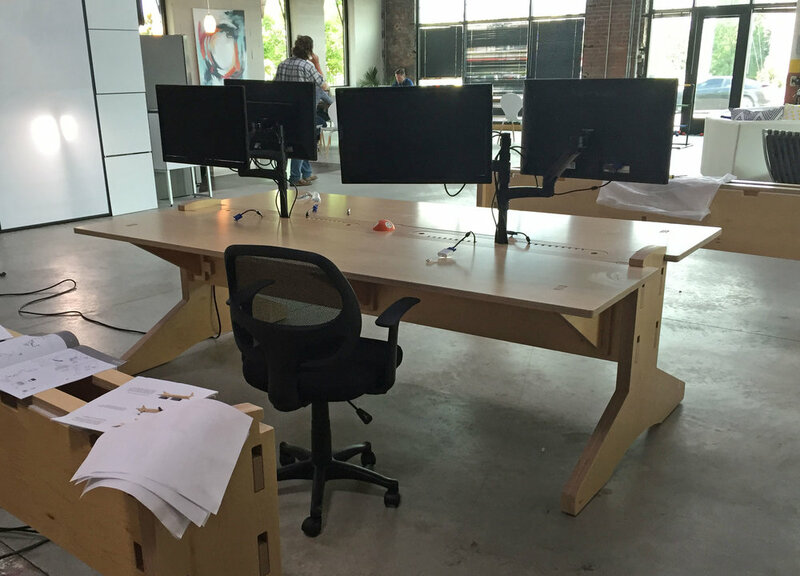 The table features two monitor arm poles for supporting individual displays for all four users. The spine of the table conceals the mounts for the two poles, and power and signal cables are kept tight to the pole and then brought back out through the slotted cover for an extremely clean appearance. The spine of the table conceals a power strip and all adapters so that users have an incredibly clean workspace. 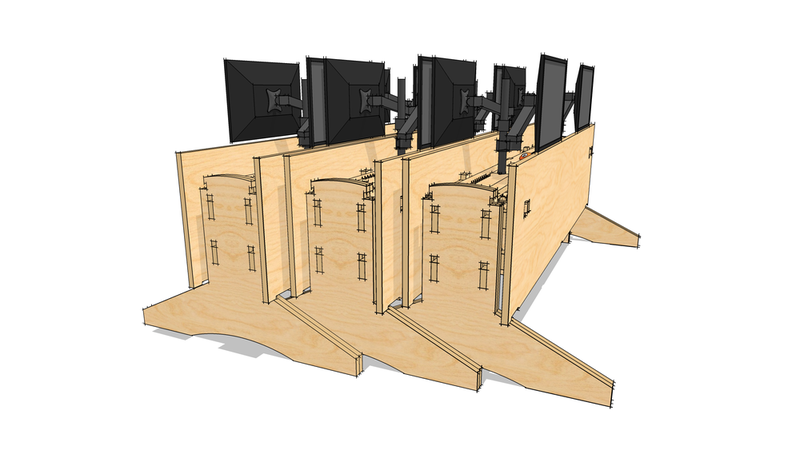 Individual covers allow each user to arrange their cables as they need, and each user can access their own connections without disturbing any other user's wiring. An attractive central plug provides two 110v outlets and dual high-output USB chargers for the occasional nomadic user. Because the open office space in which these tables will be used may be repurposed for event and other activities, this table features removable tops that can hang on the sides for compact storage. The corbels that support the tops lift out, rotate and slip back in place to provide hangers to support the tops vertically. There are no loose parts to lose or misplace because one corbel does two jobs - horizontal support and vertical storage - and you can't do either job without the corbel. It's a forcing function in disguise.